In the early 1950s my friend Charlie Mayo was a Young Communist with high ideals working as a fireman shovelling coal into steam engines out of Kings Cross. He didn’t last long in the job – 18 months or so – but while he was there he wrote a diary. 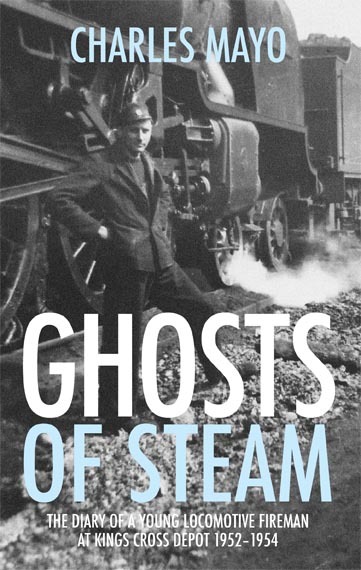 Written in Biro in an old cash book, this tells of life ‘on the rails’ in the dying days of steam, of the dirt, danger and grind of cleaning and firing those massive engines and coaxing them up hills, into sidings and under coal chutes. Most of all it’s about the hard-bitten men he worked with, the comradeship and the racism, the hardship of working conditions and the conversations – some political, some hilarious, many recounted verbatim – they had over their tea breaks. It is a marvellous, vivid piece of writing and an invaluable chunk of social history about time long since disappeared. When, well into his 80s, Charlie gave it to me to read with a view to helping him make a few copies for his family, I thought I saw something that deserved a much wider readership. We discussed it. Charlie was taken with my suggestion that perhaps we could produce something a bit more ambitious than photocopies for family members. I didn’t have the time or expertise to take on the project myself but I knew of a small company that specialised in producing life stories. Yes, a vanity publisher, but one that offered a genuine and professional service. We wanted something not only to leave for the family but to lodge in libraries, museums and archives to do with working life – and to sell some to help cover our costs. A generous friend came in with me and we split the costs (less than £1500) three ways. We took the decision to reproduce the diary in facsimile which meant that every page was effectively a colour photograph. Charlie wrote an excellent introduction and it was tailed with photos and two songs about the railway he’d written at the time (he was a folksong enthusiast and collaborated with Ewan McColl). Alison Vina at Book of My Life did a wonderful job for us and Charlie was thrilled with the result. Of the run of 120 copies, Charlie had 30 to keep, we lodged 10 with libraries, museums and archives and sent another dozen to specialist magazines and opinion formers. We sold the remaining 50-odd at a unit cost of £12. A double-page feature on Charlie in the ASLEF Journal brought a rush of requests and the whole run sold out. Needless to say, we didn’t cover our costs. But that wasn’t the point. Charlie’s wonderfully-told human story was out there for many others to read and learn from in the future. He found a new energy and purpose in seeing the project through and I learned more about the production process, printers, and how to buy ISBN numbers. And we all had great fun working on it. Charlie died less than two years later, in 2014. But I know how much the last years and months of his life were lifted by seeing his story realised in book form and knowing that it would be read and appreciated by others in years to come.